There were many tear filled eyes on Sunday during the church service when we announced that our Hispanic pastor, Edgardo Avila will be making a transition from Harbor Mid-City. Edgardo and his wife, Elizabeth have served faithfully at Mid-City for six years. They worked with pastor Stephen Phelan to launch the church. 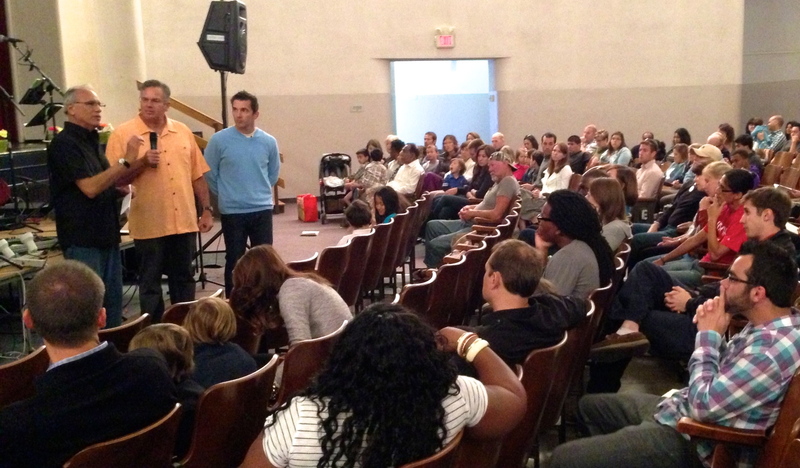 We celebrate Pastor Edgardo’s and Elizabeth’s sacrifice and service to Mid-City for 6 years. It is a bittersweet moment celebrating what The Lord has done in and through them and we will be celebrating their faithful service on May 17th. Praise God for what they have done! Many have come to Christ, and many lives have been changed through Edgardo and Elizabeth’s ministry. Dawn and I along with many at Harbor count them as dear friends. They believe the Lord is leading them on. As Elizabeth and Edgardo have come before the Lord they sense that God is calling them to serve in another ministry. They are still seeking clarity as to where that new calling will be. Edgardo said he felt like Joshua in the book off Joshua, where God was calling them to a new place, but there where many unknowns as they entered the promise land. Join us in prayer for the Avilas’ as they seek clarity for their future. Along with the announcement about Edgardo and Elizabeth moving on, we announced that Roberto Shim will be leading the Spanish-speaking ministry at Harbor Mid-City. Roberto and his wife, Mana also need our prayers as they step into this new role. We pray the Lord will use them to take our Hispanic ministry to a new level. Dawn and I will greatly miss Edgardo and Elizabeth. We love them, and the Lord has used them in incredible ways. Despite our sorrow over seeing the Avilas’ move on, we are excited about who the Lord has provided to take their place. Roberto and Mana are wonderful servants of the Lord, and we have a growing relationship with them. They are special friends, and we look forward to ministering side by side with them. Blessings to all of you as you move on into what God has planned for you! Have a wonderful week. Thank you – we appreciate your prayers for Edgardo & Elizabeth and the church. How wonderful that a trasition could take place rather than a vacancy. Yes – it is great that The Lord has already provided somebody to carry on the ministry. God bless you as you embrace all He is doing and the people He brings into your life and then releases on to others! I like that idea of releasing and that is an important part of ministry is developing and releasing and praying for God’s blessing to others!